Drastically increase your probability of survival at sea with the multiple built-in redundancies of the GlobalFIX™ V4 marine distress EPIRB. Upon activation, the GlobalFIX™ V4’s robust internal GPS accurately fixes your exact location. Your coordinates are then broadcast via a powerful 406 MHz distress signal to Search and Rescue forces worldwide. In the absence of GPS data, orbiting Cospas-Sarsat satellites can accurately triangulate your position using the 406 MHz signal alone. A 121.5 MHz homing signal further guides searchers to your exact position. 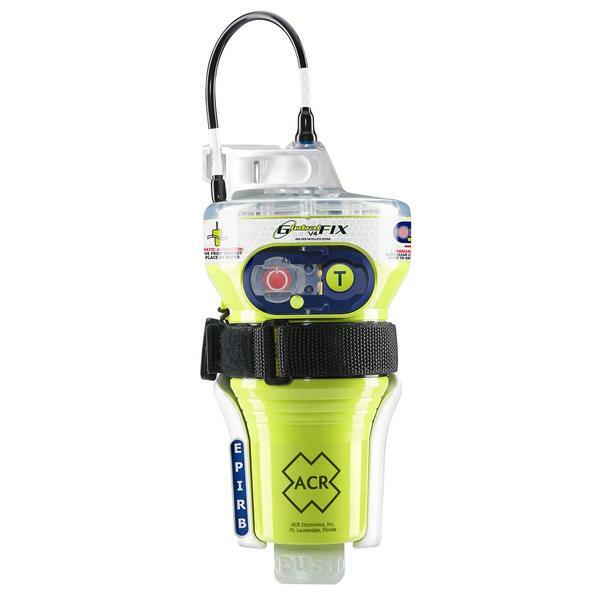 66-channel GPS: The GlobalFIX™ V4 is a full-featured EPIRB loaded with high-efficiency electronics for performance you can count on, including an internal 66 channel GPS for faster acquisition from a cold start. A protective keypad cover helps prevent false activation, and the all-new, user-replaceable battery pack has a 10-year replacement interval — reducing the overall ownership cost and making replacement a breeze. Easy self-testing: The GlobalFIX™ V4 has two functional self-tests to monitor the beacon’s transmission, power and battery performance and GPS acquisition. Pair these tests with ACR’s 406Link.com optional testing portal (available for the Americas only) and receive satellite confirmation messages directly to your cell phone or email. Weight (Beacon Only): 27 oz., (With Bracket): 34.92 oz.